On page one of ALL OUR WRONG TODAYS, we meet our anti-hero, Tom Barren. Tom, we learn, is a long way from home. Well, sort of. The thing is, the “home” he refers to is a 2016 of the future: food generators, clothing replicators, flying cars, and other innovations that make life sleek, efficient and enjoyable. A 2016 that exists on a different timeline than our current-world 2016 because of Lionel Gottreider’s engine. This engine, an ingenious source of immense power that was created in 1965, was turned on...and never turned off. (This will become important, so stick with me). Although fancy inventions and technological advancements are enough to wrap our heads around, Tom also grounds us in his story with humanness we can all relate to in some way: dysfunctional family dynamics. As the son of a genius, Tom has always been a disappointment to his father and society-at-large. He has no illusions of grandeur and is content, for the most part, to play the role that his life has dealt him: a job at his father’s lab where an actual time machine is being built, made possible by Gottreider’s engine, which, because it was never turned off, leaves a trail of radiation to follow back throughout the years. Relegated into this position that will embarrass his father the least, Tom serves as an understudy to the best and most capable chrononaut --- think an astronaut but for time travel --- Penelope Weschler, training for the first launch. But when the carefully planned launch date goes sideways (for reasons I won’t go into here for fear of the dreaded spoiler), Tom ends up making the trip back in time alone and unintentionally takes action that sends him into an alternate timeline. Stuck in current-world 2016 and feeling the weight of the consequences of his mistake, Tom begins to build relationships while tracking down answers to put the timeline back on track. "ALL OUR WRONG TODAYS is thoroughly entertaining as it zips along through time, offering philosophical commentary and incisive glimpses into what it means to be human along the way. 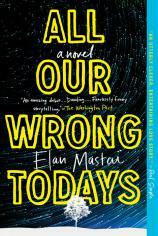 Elan Mastai has crafted a sharp and articulate masterpiece that boggles the mind and warms the heart." There are so many things to like in the pages of ALL OUR WRONG TODAYS, not the least of which is the world building that Elan Mastai undertakes with brilliant results. For a few hours, my imagination was unleashed --- I felt like the future 2016 that he described was a tangible reality. I could picture the havoc flying cars might wreak. I envied the ability to create a tailored outfit without having to actually shop in a store. And I wondered how my life would change if teleportation was available with the push of a button. The tone of the writing and the setting made me flash back to reading READY PLAYER ONE by Ernest Cline. But I think ALL OUR WRONG TODAYS surpasses it. Now, as someone who would rather diagram 100 sentences than sit for an hour in a physics lecture, I can’t even conceive of the brilliance that it takes to author a book that takes on not only the hypothetical inventions of the future, but also the theoretical science of time travel. It’s enough to make a person’s eyes glaze over, but the characters and crisp, clever writing kept me turning pages and wondering how the story would find its ending. What also helps a reader from getting hopelessly lost are the short chapters and the narrator’s charming “shrugged shoulders” kind of approach to the story. For the most part, Mastai managed to help me keep moving forward, even with all the information thrown at me with every step along the way (Alternate timelines! Different time travel methodologies! Multiple relationship dynamics! ), and there was a clarity provided with all the details that enriched the experience. For me, the exception to this came at the end of the book. The momentum fell a little flat as the focus became less about the relationships that Tom was forming and more about resolving the science-y time travel conundrum. The ending was a bumpy one for me --- almost as if the author was giving an award acceptance speech and the music started playing him off the stage. In the last few pages, the plot got more and more complicated and became increasingly difficult to follow. Specifically, the logical physics of time travel that I bought into at the beginning of the book began to twist and turn into confusion as it ended. If I had one other complaint about the book, it would be that, in my opinion, where READY PLAYER ONE’s plot relied on ’80s nostalgia to move the story along, the key turning points of ALL OUR WRONG TODAYS depended on Tom’s multiple sexual encounters. Each pivotal plot twist was preceded by at least one of these instances. While the scenes weren’t necessarily graphic, I took issue with the general lack of respect shown for the women in many of these encounters, leaving me disappointed in our main character. (In fact, current-day 2016 Tom finally becomes self-aware and realizes this himself, to some degree.) Ultimately, in a book chock full of imagination, the overuse of this trope as a mechanism to create forward momentum was certainly a viable and ultimately effective route, but not one that I found particularly innovative. The antidote and where the author does succeed is in drawing Penny, Tom’s eventual love interest (alternate timeline Penelope, for those keeping track). She is full of life, sharp as a tack and a match for Tom in every way. Fearless in life and love --- I mean, how many people would give the benefit of the doubt to a guy who shows up and explains that he has traveled through time? --- Penny provides the heartbeat for the book and, by association, makes Tom a better version of himself that I could root for. ALL OUR WRONG TODAYS is thoroughly entertaining as it zips along through time, offering philosophical commentary and incisive glimpses into what it means to be human along the way. Elan Mastai has crafted a sharp and articulate masterpiece that boggles the mind and warms the heart.